How goes it? I'm doing okay. The little one picked up the stomach flu from daycare so you know what that means! I love that she's in daycare but those places are like harbouring places for all sorts of wonderful things lol. So this is the first time that I've ever tried a KleanColor nail polish. Yup. I know that some of you might be shocked but to tell you the truth I've never came across this brand...EVER in Toronto. The last time I went home to Barbados was where I saw them and obviously I had to pick up a few of them. Let's take a look at this polish! 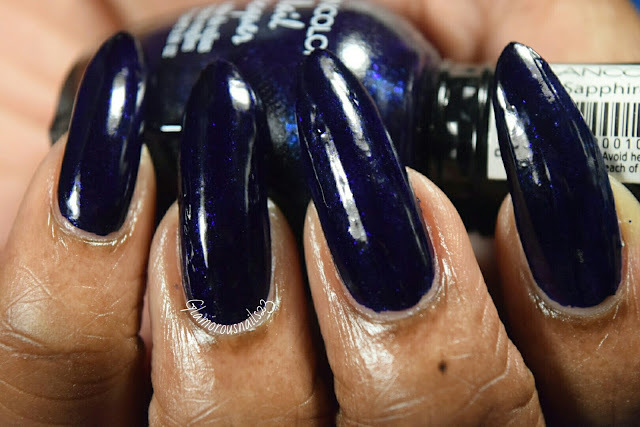 Sapphire is a blue creme polish that contains some blue micro glitters. The micro glitters are noticeable in the bottle and with the first coat. they seemed very noticeable until the polish dried. The formula on this one was a bit thick but it is still easy to work wit h and she has good coverage. Sapphire is a one coater!!!! I just love polishes that can be applied in one coat don't you? I must say though that the polish did have a very unusual smell to it. I'm not sure if this is the norm for KleanColor polishes seeing as this is my first time ever trying one. This lovely polish is a stainer so you may want to double up on your base coat. Shown in the photos is one coat with a top coat. I really do like this polish. 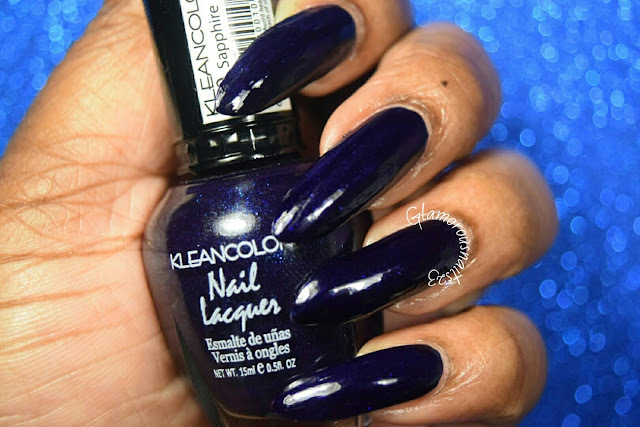 It may also have to do with the fact that my birthday is in September and my birthstone is a Sapphire:P. Do you own any KleanColor polishes? Which ones are your favorite? What are your thoughts on Sapphire? Let's chat below! Sorry about little! I love Kleancolor, the smell not so much but hey sacrifices right? I honestly thought that they were in sparse in Toronto lol. I think I may have picked up three more while I was on vacation. Thank you!! I know :(. I wish it would have been more visible. This color is pretty. 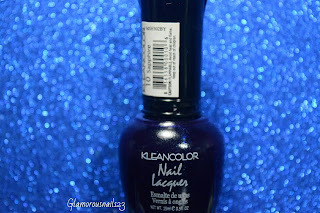 My boyfriend actually gifted me my first Kleancolor a few months ago. I had never heard about it either. They are not all over the place in Miami either so no worries. I have a few pastel colors that are really pretty! Awe that was so sweet of him! That's so strange. You would think that they would be more accessible. Ooo I would love try some of the pastel colors.